Do you want better performance in your storage solution? Interested in how all-flash software-defined-storage is building next-generation data centers? If so, this webinar is for you. 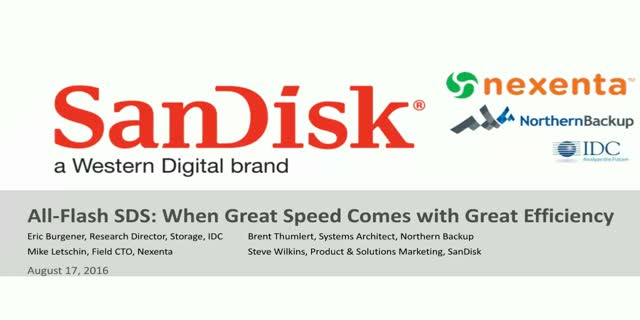 Eric Burgener, IDC Storage Practice Research Director, and Systems Architect Brent Thumlert of Northern Backup, join Nexenta and SanDisk to share insights on all-flash array market trends, the future outlook, and why an increasing number of companies are adopting all-flash SDS. Leading IT & managed services provider Northern Backup will share real-world performance metrics for the NexentaStor and InfiniFlash™ System solution and how they were able to ensure the highest levels of service, performance, and capacity, while saving on power, cooling, and space. The time has come to take control of your storage destiny. Join us by registering today!